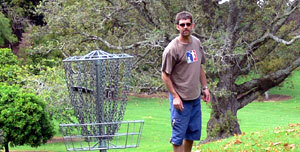 The Champ - A appreciative gallery applaud a year of disc golf for Simon Feasey that culminates in the title of 2006 Match Play Champion. Mental Mentor - After an evening of basketball, touch, cricket and forceback, NZ Grand Master Champion Pete Boyle shows youngster Bruno Whale (Taumarunui) how to perform like a true athlete. Happy Family - Disc golfing friends had a great time getting together yet again to play the game they love. Now they're all talking about 2007! Familiar Sight - Other than the scary facial hair, we have come very familiar with the sight and sound of The Fease planting putts in from anywhere. Another nail in the coffin for one of his competitors on hole 4. 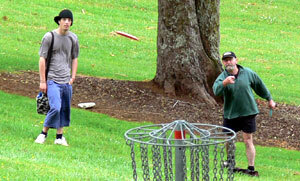 Bowled Over - Tournament Director Bob Gentil is either getting at one with the park, or making a tough second on hole 3. We prefer to think its the latter. Stay Calm - As Pete Boyle (Taumarunui) takes in the beauty of Monte Cecilia Park, Hamiltonian Josh Smith shows the calm approach of a true professional on the 17th tee. "It Was The Chair" - Pundits were somewhat shocked to find the mild Mexican Juan Unda defeated the Grand Master and Course Designer Bob Gentil 1-0. Spectators put it down to some fine play, including 3 putts over 30 feet, but Unda knows what made the difference - the big chair! 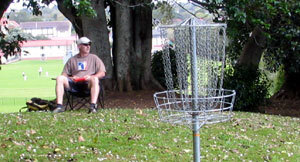 Just Great - It may be nail biting competition, but players cannot but take in the beauty of Monte Cecilia Park. Here some of the final eight catch up on gossip as they head to the 11th green. Peek-A-Boo - A tricky shot for Brit golfer Matt Cutler on the 4th. Golfers were saddened to hear Matt will be leaving our shores soon, but they will be boosted by the knowledge he hopes to enjoy our hospitality again when he can get back. Let Her Rip - A wicked action shot of the Joines release as Blair goes for maximum power on release during the final - here on hole 8. 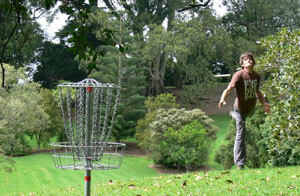 On A Pedestal - Siep Van Vliet (Waiheke) is all style here as he plants in a super putt on the 17th. Looking strong as he finally gets some power back into his injured right arm, Siep stunned the golfing world through 2006 by throwing left handed! Half Time Entertainment - Multiple uses for a fairway! Players were treated to some pretty on the edge trolley riding. Clutch Cargo - With a jaw squarer than a Roadie Reunion, Bob Gentil fires a confident second on the tough 2nd. 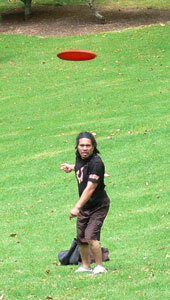 As usual, he's shooting from the middle of the fairway. Who Needs Music? - Back from hours in the Spa if Wisdom, Tim McVitty (Wellington) just couldn't stop dancing. This Is Support? 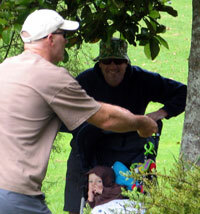 - Part time golfer, part time male No Sleep Pete Anderson (Blenhiem) brought his son Fletch along to see the country's best disc golfer. They also found time to check out Juan Unda! This Is The Future?! 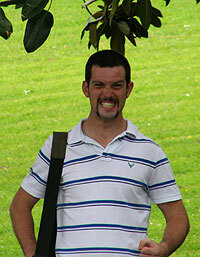 - Fired up and ready (minus a bit of sleep), David Keene (Auckland) was out to show a bit of local knowledge. And then Bob went and redesigned the course! 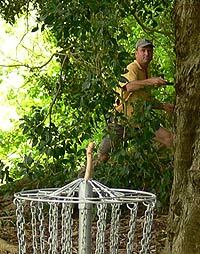 Chain High - A classic shot on hole 4 of what players were up against when playing Simon Feasey. Here in the final, number 2 seed Blair Joines (Taumarunui) realises once again that he is going to have to fire another birdie just to half the hole. Awesome golf. There's A Gap - The super short 5th seemed so easy. But any stray drives could lead to being snookered. 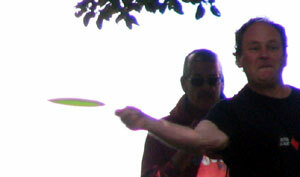 Here Brett Hailstone (Waiheke) goes for the tiny gap in a desperate attempt to stave off the Fiery Feasey Fracas. Flying High - Everyone was pleased to see seasoned Auckland based golfer Gene Tutaki (Taumarunui) along for the ride. 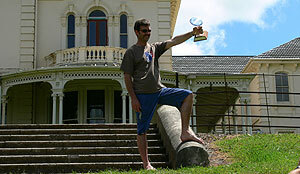 On Top of the World - Holding a trophy that already had his name carved on it, Simon Feasey celebrates another bumper year of disc golf (including a win overseas). And a year that saw the birth of his second daughter Caitlin. Well done!